Jambiya (incertae sedis - uncertain placement within Perilampidae). Biology Either hyperparasitoids of Lepidoptera through Tachinidae (Diptera) or Ichneumonoidea, or primary parasitoids of wood-boring beetle larvae (Anobiidae and Platypodidae), and less commonly Hymenoptera, Orthoptera or Neuroptera. Bouček, Z. 1978. A generic key to Perilampinae (Hymenoptera, Chalcidoidea) with a revision of Krombeinius n.gen. and Euperilampus Walker. Entomologica Scandinavica 9:299-307. Darling, D.C. 1982. Description of a New Species of Krombeinius (Hymenoptera: Perilampidae) from the Philippines, and the Phylogenetic Relationships of the Genus. Psyche 89: 307-316. Darling, D.C. 1988. 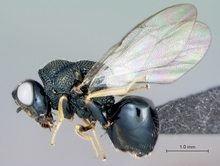 A review of the genus Krombeinius (Hymenoptera: Perilampidae) with a reexamination of generic limits and phylogenetic relationships and the descriptions of two new species. Journal of the New York Entomological Society. 96(1): 70-74. Darling, D.C. 1995. New species of Krombeinius (Hymenoptera: Chalcidoidea: Perilampidae) from Indonesia, and the first description of first-instar larva for the genus. Zool. Med. Leiden 69: 209-229. Darling, D.C. 1996. Generic concepts in the Perilampidae (Hymenoptera: Chalcidoidea): an assessment of recently proposed genera. Journal of Hymenoptera Research 5 pp. 100-130. Heraty, J.M. & D.C. Darling. 2007. A new genus and species of Perilampidae (Hymenoptera: Chalcidoidea) with uncertain placement within the family. Proceedings of the Entomological Society of Ontario 138: 33-47. Rasplus, J.-Y. 1987. Description d'une nouvelle espèce du genre Krombeinius Bouček, 1978 récoltée en Afrique de l'ouest (Hymenoptera, Perilampidae). Revue Française d'Entomologie (nouvelle série) 9: 9-12. Risbec, J. 1951. 1. Les Chalcidoides de l'Afrique occidentale française. Mémoires de l'Institute Français d'Afrique Noire, Ifan-Dakar. 13:7-409. Strand, E. 1911. Neue exotische Chalcididen der Gattungen Phasgonophora Westw., Heptasmicra Ashm., Anacrytpus Kby., Antrocephalus Kby., Aperilampus Wlk and Chryseida Spin. (Schluss) Fauna Exotica. 1(3):9-10. Walker, F. 1871. Part 4. Chalcididae, Leucospidae, Agaonidae, Perilampidae, Ormyridae, Encyrtidae. Notes on Chalcidiae. 55-70. London. Photograph of Jambiya © John Heraty & Chris Darling.